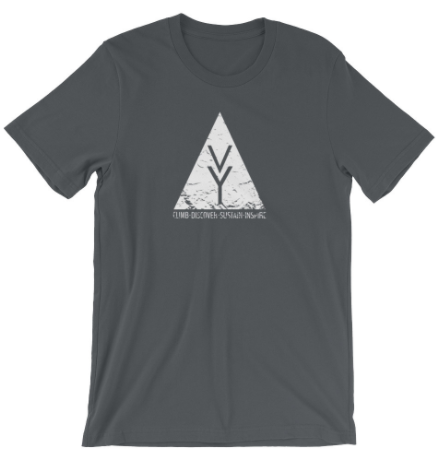 Support the Vertical Year by purchasing some merch! Buy purchasing any of the following products you will be helping to improve youth mental health and combat climate change. How? Well 100% of all proceeds from these products will be donated to our partner charities - ReachOut Australia and the Australian Climate Council. More importantly though you will be representing the campaign in the public domain. Grass roots marketing is incredibly powerful so when people ask you why you are sprouting a piece of Vertical Year merchandise you can share your perspective on the ethos of this campaign. Powerful stuff! This piece of quality clothing sports the VY logo on the front and then all the key information on the back. A great way to show your support of the campaign. Available in a wide range of colours you can look fine whilst supporting a good cause. *Pricing is in $US and for men's t shirt. Base price varies for women's and v-neck style shirts and I am unable to adjust the sale price. I apologize for this. The standard VY shirt displays a distressed version of the campaign logo on the front. Coming in a wide range of sizes and colours this is another great option to show your support. 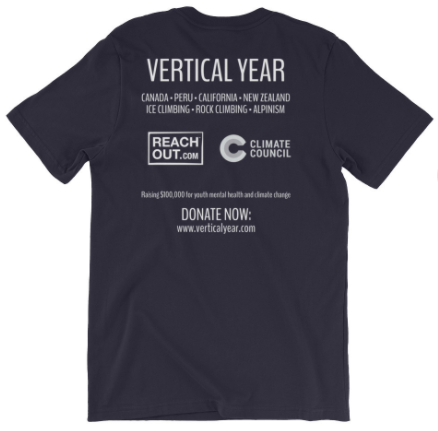 A t-shirt to commemorate the Canadian portion of the Vertical Year journey. The shirt depicts Josh on one of the ice climbs in the Canadian Rockies and was derived from a photograph collected on the trip. The beautiful mountain of Alpamayo inspired the Vertical Year project. This shirt commemorates the successful ascent of the peak on the 22nd June 2018.